The large mass to the right also changed, with bright areas growing larger, some brighter, and new outlines. Radar may be picking up discharge activity. Maybe from shallow areas of the sea. Liquid methane, alleged to be the actual "seas" on Titan, must exist at -161.6°C (-258ºF). I'd like to know some things, in situ , about this condition in actuality. What is the density? What is the surface tension of this fluid like (strong or weak)? To what depth does this liquid methane remain a liquid on Titan? What if the "sea" is merely centimeters or millimeters deep? What if it is an ice sheet of methane over a dark regolith (black ice)? I feel they are being very liberal in their use of the word "sea." This is what they did with Earth's Moon. Its dark areas were regarded as seas when they were actually bone dry basins of rock. Even if liquid methane were actually on the surface at Titan it may be so thin of a layer that it wouldn't be able to produce any wave activity even in a gale. Or it may be so viscous that it stands like a solid. 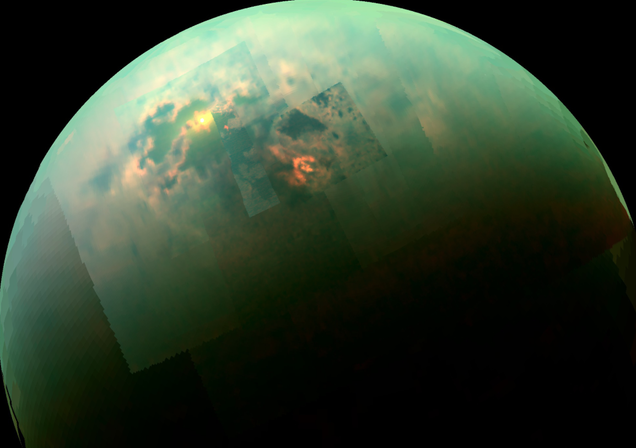 New maps of Saturn's moon Titan reveal large patches of trace gases shining brightly near the north and south poles. These regions are curiously shifted off the poles, to the east or west, so that dawn is breaking over the southern region while dusk is falling over the northern one. The pair of patches was spotted by a NASA-led international team of researchers investigating the chemical make-up of Titan's atmosphere. "This is an unexpected and potentially groundbreaking discovery," said Martin Cordiner, an astrochemist working at NASA's Goddard Space Flight Center in Greenbelt, Maryland, and the lead author of the study. "These kinds of east-to-west variations have never been seen before in Titan's atmospheric gases. Explaining their origin presents us with a fascinating new problem." In this study, the researchers focused on two organic molecules, hydrogen isocyanide (HNC) and cyanoacetylene (HC3N), that are formed in Titan's atmosphere. At lower altitudes, the HC3N appears concentrated above Titan's north and south poles. These findings are consistent with observations made by NASA's Cassini spacecraft, which has found a cloud cap and high concentrations of some gases over whichever pole is experiencing winter on Titan. The surprise came when the researchers compared the gas concentrations at different levels in the atmosphere. At the highest altitudes, the gas pockets appeared to be shifted away from the poles. These off-pole locations are unexpected because the fast-moving winds in Titan's middle atmosphere move in an east–west direction, forming zones similar to Jupiter's bands, though much less pronounced. Within each zone, the atmospheric gases should, for the most part, be thoroughly mixed. The researchers do not have an obvious explanation for these findings yet. "It seems incredible that chemical mechanisms could be operating on rapid enough timescales to cause enhanced 'pockets' in the observed molecules," said Conor Nixon, a planetary scientist at Goddard and a coauthor of the paper, published online today in the Astrophysical Journal Letters. "We would expect the molecules to be quickly mixed around the globe by Titan's winds." At the moment, the scientists are considering a number of potential explanations, including thermal effects, previously unknown patterns of atmospheric circulation, or the influence of Saturn's powerful magnetic field, which extends far enough to engulf Titan. NASA scientists have identified an unexpected high-altitude methane ice cloud on Saturn's moon Titan that is similar to exotic clouds found far above Earth's poles. This lofty cloud, imaged by NASA's Cassini spacecraft, was part of the winter cap of condensation over Titan's north pole. Now, eight years after spotting this mysterious bit of atmospheric fluff, researchers have determined that it contains methane ice, which produces a much denser cloud than the ethane ice previously identified there. "The idea that methane clouds could form this high on Titan is completely new," said Carrie Anderson, a Cassini participating scientist at NASA's Goddard Space Flight Center in Greenbelt, Maryland, and lead author of the study. "Nobody considered that possible before." Methane clouds were already known to exist in Titan's troposphere, the lowest layer of the atmosphere. Like rain and snow clouds on Earth, those clouds form through a cycle of evaporation and condensation, with vapor rising from the surface, encountering cooler and cooler temperatures and falling back down as precipitation. On Titan, however, the vapor at work is methane instead of water. The newly identified cloud instead developed in the stratosphere, the layer above the troposphere. Earth has its own polar stratospheric clouds, which typically form above the North Pole and South Pole between 49,000 and 82,000 feet (15 to 25 kilometers) -- well above cruising altitude for airplanes. These rare clouds don't form until the temperature drops to minus 108 degrees Fahrenheit (minus 78 degrees Celsius). Other stratospheric clouds had been identified on Titan already, including a very thin, diffuse cloud of ethane, a chemical formed after methane breaks down. Delicate clouds made from cyanoacetylene and hydrogen cyanide, which form from reactions of methane byproducts with nitrogen molecules, also have been found there. But methane clouds were thought unlikely in Titan's stratosphere. Because the troposphere traps most of the moisture, stratospheric clouds require extreme cold. Even the stratosphere temperature of minus 333 degrees Fahrenheit (minus 203 degrees Celsius), observed by Cassini just south of the equator, was not frigid enough to allow the scant methane in this region of the atmosphere to condense into ice. What Anderson and her Goddard co-author, Robert Samuelson, noted is that temperatures in Titan's lower stratosphere are not the same at all latitudes. Data from Cassini's Composite Infrared Spectrometer and the spacecraft's radio science instrument showed that the high-altitude temperature near the north pole was much colder than that just south of the equator. It turns out that this temperature difference -- as much as 11 degrees Fahrenheit (6 degrees Celsius) -- is more than enough to yield methane ice. Other factors support the methane identification. Initial observations of the cloud system were consistent with small particles composed of ethane ice. Later observations revealed some regions to be clumpier and denser, suggesting that more than one ice could be present. The team confirmed that the larger particles are the right size for methane ice and that the expected amount of methane -- one-and-a-half percent, which is enough to form ice particles -- is present in the lower polar stratosphere. The mechanism for forming these high-altitude clouds appears to be different from what happens in the troposphere. Titan has a global circulation pattern in which warm air in the summer hemisphere wells up from the surface and enters the stratosphere, slowly making its way to the winter pole. There, the air mass sinks back down, cooling as it descends, which allows the stratospheric methane clouds to form. "Cassini has been steadily gathering evidence of this global circulation pattern, and the identification of this new methane cloud is another strong indicator that the process works the way we think it does," said Michael Flasar, Goddard scientist and principal investigator for Cassini's Composite Infrared Spectrometer (CIRS). I saw that earlier this evening. It does look like the Sun glinting off an ocean, like on Earth. It's very compelling of an image to strengthen the case for a liquid surface. A problem with the liquid surface theory is that they've never detected wave activity on the surface. I don't know if this is due to the lack of sensitivity of the instruments or lack of substantive wind at the surface. I know the atmosphere is very complex, vast, and has extremely high winds at higher altitudes. But the air seems to barely move at the surface--very strange in and of itself. That's assuming, of course, that the picture has not been "processed", as so many such pictures are. That's an awfully powerful glint for something so many AU away from the sun. At any rate, those "seas" are not nearly the oceans they said were needed to replenish Titan's atmosphere, even if they are seas. And there bottoms which have no "waves" of over - what was it? - a millimeter in size do not sound like seas to me. It almost looks like the shimmer of aurora lights, except distributed over a dispersed area. Is that possible? "...a fellow of infinite jest, of most excellent fancy..."
or it might as well be according to the comments. Notice there's not a single voicing of any alternative theory for the phenomena. Until a probe lands on the alleged "liquid seas" of Titan, nobody will know the nature of Titan and its surface. In regards to Weird 'Island' on Saturn Moon Titan Puzzles Scientists..
Titan's seas are hydrocarbon, and the temperatures are near to the freezing point of methane and ethane. I was looking for the properties of ethane and methane at 1.5 (Titan Atmos.) bars at - 180c. These are the conditions to look at as a starting point. I searched but didn't find much, and Ive never fully studied fluid dynamics. Anyhow, we are all familiar with water ice. It freezes at the surface because its density as a solid is less than its liquid phase. But what about Methane and Ethane? Is it possible that the appearing islands are actually large icebergs of hydrocarbon compounds forming on the bottom of the lake and floating to the surface? Perhaps they are near neutral buoyancy, but some seasonal temperature or pressure changes cause them to surface? Up to this point, scientists had assumed that Titan lakes would not have floating ice, because solid methane is denser than liquid methane and would sink. But the new model considers the interaction between the lakes and the atmosphere, resulting in different mixtures of compositions, pockets of nitrogen gas and changes in temperature. The result, scientists found, is that winter ice will float in Titan's methane-and-ethane-rich lakes and seas if the temperature is below minus 297 degrees Fahrenheit (90.4 kelvins).. So, I don't see that they have considered the possibility Ive postulated. Just a new guy here. Could be that, too, as in high altitude ice clouds. That happens on Earth. There is no hydrocarbon rain. Huygens didn't see any rain. The surface features look arc machined. The glint in the picture is refraction. The temperature and thickness of Titan's atmosphere seems to be within the liquid-solid phase boundary of liquid methane - ethane. I could be wrong. In fact, I am wrong most of the time. I really do enjoy the discussion though.